One would imagine that superheroes would make for a great musical inspiration. Indeed, if past scores have been any indication, it seems like an easy assumption to make — even outside of the feature film world. Take Christopher Drake’s material for films like Batman: Under the Hood as an example. 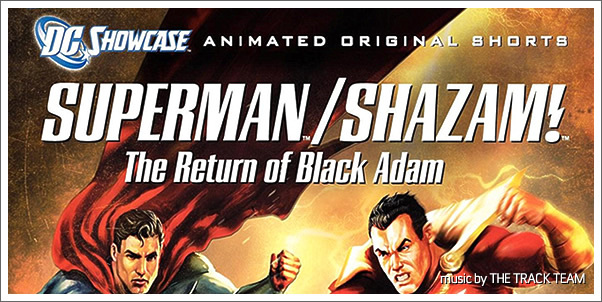 Whatever magic inspiration was being channeled there seems to have flown over the heads of JEREMY ZUCKERMAN & BENJAMIN WYNN, whose collected material from SUPERMAN/SHAZAM: THE RETURN OF BLACK ADAM and other DC original animated shorts (JONAH HEX, GREEN ARROW, and THE SPECTRE) is frustratingly lackluster and makes for an uneven and unsatisfying listening experience. Skipping over the negligible “WB Logo” (1) stinger to the “DC Showcase Main Title” (2) gives us a good sense of what’s to come. The synthy opening pushes into what promises to be a strong and engaging theme; mysterious and colourful. Unfortunately, as soon as we expect it to actually start, it ends with a twinkly flourish. Make note of that feeling of flattened anticipation because you’ll be revisiting it a lot throughout this album. “Black Adam” (3) is a dark 5-note theme for the villain that’s presented once in the low strings and woodwinds before the cue hammers itself out with percussive hits after a mere 40 seconds. So much for tension. The mood takes a sharp turn with “Billy Batson” (4), a cheerful and light track that presents a simplistic but effective and pleasant characterization of Billy. It’s also the first track on the album thus far that’s longer than a minute, so the ideas have a bit of time to breathe and develop.